Travel is the road I take, to find my way back home. Why do I love to travel and what about it makes me happy? – The chance to see a new place? – Experience a new people? – An escape from the mundane? – The opportunity that it presents at times to witness something unique? – Or is it the change of sight? The new smells, colours, tastes? – Something new my money can buy? Frankly speaking, it’s a bit of everything. Although I wonder if it’s just the fact that I get to dive into something new, that makes me travel? The fact that I get to leave my real life behind for a bit? And when I really come to ponder on it, I realize there is much more to travel than just that – Than it just momentarily painting a pretty picture for me. Traveling helps me stab all the negativity within me. I often find myself brought down by the weight of the world. Depressed with where I stand in life and my relationships with people. I sometimes lose faith not just in everyone around me, but mostly myself. I get fed up with the pace of life. Traveling gives me the space I require. Gives me time to breathe and just be. Not worry about anyone or anything in particular. I can exist in a particular moment and at the same time fail to exist. Yes, it is an escape, but not a permanent one. It serves, as that much needed getaway when I am sick of the world around me. That much needed break from the life back home. It is an escape, from what I am back home and the prospect of getting to know myself better and unleashing a better side to me. I find myself a changed man of sorts when I am back from my travels. I feel anew. I feel like I can do anything. Traveling helps me find myself again. It helps me breathe life and joy into whatever I do. It helps me come back to all the things I love. It helps me forgive and forget. It makes me want to form a stronger bond with people and things once again. Helps me create. Restores my faith in the world and more importantly in me. See you soon guys. 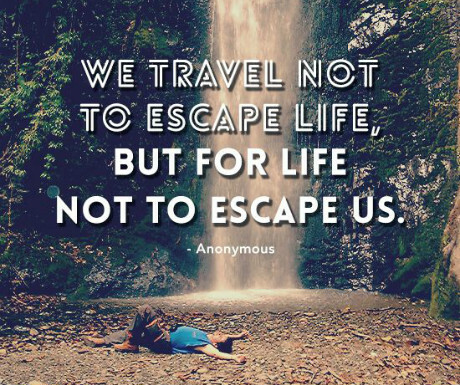 Until then, Travel!